Have termites, fleas or bedbugs made themselves comfortable in your Florence home or business? These pests are among the most prevalent in this part of South Carolina, and each causes its own, unique problems. As nice as it would be to tackle this issue yourself, such infestations are rarely detected until they are far beyond the scope of do-it-yourself measures. To rid your home or business of fleas, termites, bedbugs or other pests once and for all, professional intervention is crucial. In Florence, Titan Termite & Pest Control has you covered. 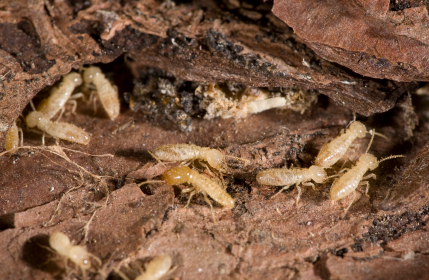 Few homeowners or business owners need to be admonished about the dangers of termites. Unlike many pests, they're more than just a nuisance. They cause significant, increasingly serious damage over time. The longer the issue is left alone, the more the colony grows. In turn, the more serious the damage becomes. The instant you suspect a termite infestation is underway, contact Titan Termite & Pest Control. Our experienced, talented technicians will identify the types of termites that have invaded and determine the severity and extent of the infestation. With this information, they will devise the most appropriate strategy for eliminating them. This may include treating soil around the perimeter with termiticide or positioning bait stations at strategic points. Either way, you can rest assured that your termite problem will quickly become a thing of the past. Whether they've invaded your Florence home or business, bedbugs are nothing but bad news. In a home, they can make it downright impossible to get a good night's sleep. In a business, they can scare away customers and wreak all kinds of additional havoc. The worst thing of all is that they're incredibly difficult to eradicate. Do-it-yourself measures just don't work, so the first step is to call in the pros. Titan Termite & Pest Control will assess the situation and develop a customized plan of attack. Our techs know where these wily pests typically hide and will not only exterminate them but will help you take steps to keep them from coming back. Most people associate fleas with pets like dogs and cats. They typically seek out host animals like these, but they love nothing better than finding a nice, warm home or business to hunker down in too. When fleas are allowed to run amok, they can quickly run out of animal hosts and move over to human ones. If you and your family or customers are being bitten, the time to act is now. Fleas don't just stay out in the yard; they easily get into Florence businesses and homes, where they spread like wildfire. Titan Termite & Pest Control will exterminate fleas in your business or home and help you adopt preventative measures so you never have to deal with those nasty bites again. Pests like bed bugs, fleas and termites make people miserable. In many cases, they can cause significant and costly damages to homes and businesses in and around Florence too. Putting issues like these on the back burner isn't an option. At the first sign of trouble, forget about taking matters into your own hands. Instead, contact Titan Termite & Pest Control. We've proudly served Florence and the entire state of South Carolina for years and are ready to assist you, so give us a call now.